Hello Duelists! At YCS Chicago 3 Shaddoll decks managed to make it into the top 32, but none of them (as far as I know) had the intension of winning by not letting their opponent play Yugioh. This week I'll be sharing a deck with you guys that I had tested for quite a while: Floodgate Shaddolls. Let's get right into it! The goal of the deck is simple: not to let your opponent play the game, owing to the vast amount of floodgates that you have. This deck’s best matchup is Nekroz, because they don't have many (if any) outs to floodgates game 1. The function of the deck is pretty simple - get to your floodgates. 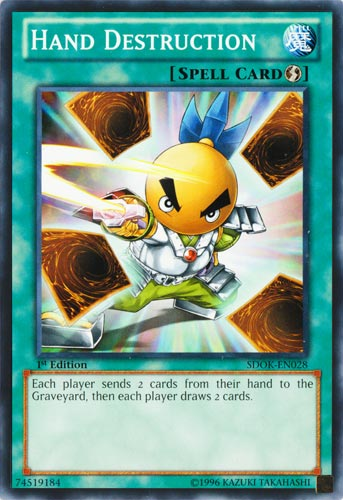 To do this you have cards like Shaddoll Beast, Upstart Goblin and a whopping 3 Hand Destruction. The way the deck is built is to beat Nekroz, so odds are that you will be losing game 1 against decks that aren't Nekroz. Keep in mind that you'll usually be going first, because you want to go first and play your floodgates. This is convenient because decks that are vulnerable to this strategy, except Satellarknights, will often choose to go second, so you'll be going first a lot. This is because you really only want 1-2 monsters in every hand; having more reduces the amount of draw power and floodgates you have access to. When playing against Nekroz, they don't really have any relevant backrow game 1 except occasionally Emptiness which is the reasoning behind only 1 Shaddoll Dragon. This is just to help you accomplish the goal of the deck, which is to get to the floodgates. The cool part about this card is that since discarding isn't a cost, it will trigger your Shaddoll effects. So if you send a Squamata, Beast, Hedgehog, or even Falco, this -1 is no longer a -1. Even though your opponent gets to fix their hand as well, it usually won't matter since they probably won't be able to deal with all your floodgates. The main reason people use this card in their Shaddoll deck is to send it with Mathematician to out the Djinn lock, but since you're usually going first, you just floodgate them and they can't even set up the Djinn lock, thus this card became unnecessary. Not to mention that setting Squamata or Dragon will also out the Djinn lock if they don't have Nekroz of Trishula in their hand. Fusion spells don't really help you to accomplish your goal of getting to floodgates and just lead to more brick hands, thus I cut it to the minimum amount possible. I felt 3 El Shaddoll Fusion was pretty important because you can chain it to Nekroz of Trishula’s effect and get cards out of your hand and then Trishula won't be able to resolve (assuming there are no more cards in your hand). Another relevant interaction is if you attack, and they use Nekroz of Valkyrus you can chain El Shaddoll Fusion and fuse with the attacking monster, then Nekroz of Valkyrus will resolve without effect. This is probably the strongest card in the deck. Since most Nekroz decks don't use Dance Princess or Great Sorcerer this card is essentially an autowin if you can prevent them from overlaying with 2 Manju / Senju because they'll never be able to use spells so there's not much they can do. Keep in mind that if you open Mathematician you can send Falco, then on your turn synchro summon Armades (if you have another summonable Spellcaster) and you will probably autowin because your opponent won't be able to use Nekroz of Valkyrus to stop an attack from Armades which means that they can't protect their level 4 monster. Opening multiples of this card isn't desirable but isn't exactly a huge issue because odds are the first copy will be more than enough to end the game. I really would like to play a second copy of this card but there is no space, so as a result I was forced to only include one as opposed to two. Most decks don't really touch their extra deck so I didn't feel it necessary to play multiple light monsters, especially ones that don't really do that much to prevent my opponent from playing, so I felt that the 1 Thunder King Rai-Oh was the only light monster I wanted. 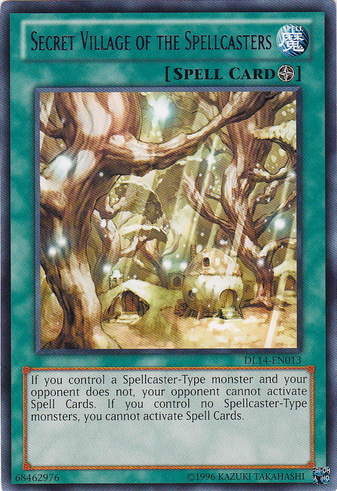 A problem that you may notice after testing the deck is that some games you don't draw any useful monsters which is a big problem since it makes a lot of your deck dead, like your Secret Villages and Fusion spells. This isn't a slow format either so if you don't have a monster by turn 2, odds are that you're going to get OTK'D. But the biggest problem is one that's uncontrollable: not playing against Nekroz. This would ultimately be the reason why I chose not to play the deck at YCS Chicago. This deck has an insanely good matchup against Nekroz but a very mediocre one against pretty much everything else game 1. That's why the side deck is so important, you're going to be losing game 1 to anything that's not Nekroz a fair amount of the time, so post-siding you are basically playing regular Shaddoll, which isn't exactly a bad thing since most decks that aren't Nekroz struggle with El Shaddoll Winda. That's all for this week's article! Special thanks go out to Dango from DGZ for coming up with the deck idea and to Robert Mushkatblat for bringing this deck to my attention and helping me fix the list. If you'd like to see me write about a certain topic feel free to message me on Facebook. The Circuit Series stops by Richmond, VA next on May 2-3! And As Always Play Hard or Go Home!